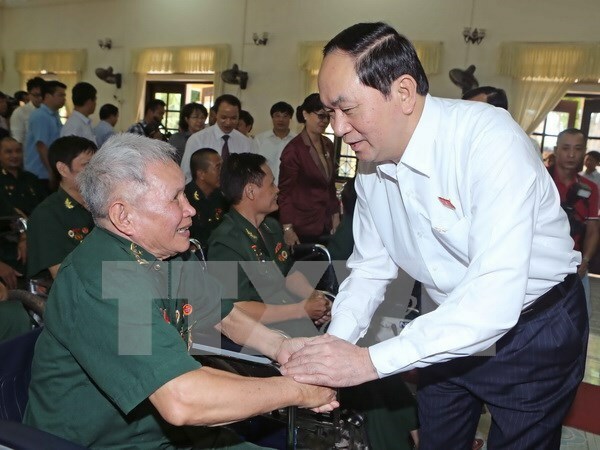 Hanoi (VNA) – President Tran Dai Quang on July 26 visited and presented gifts to sick and wounded soldiers being cared at nursing centres in northern Ha Nam province on the 69th War Invalids’ and Martyrs’ Day. The President expressed his deep gratitude to martyrs, invalids and their families for their great contributions and precious sacrifice in the struggle to defend the country’s independence. The President affirmed that the Party, the State and people always remember and feel grateful for the contribution and sacrifice of generations of heroic martyrs and invalids and take responsibility for taking care of these people and their families. In other related news, Director General of the Vietnam News Agency Nguyen Duc Loi visited and handed gifts to some martyrs’ families and invalids in Trieu Phong district, central Quang Tri province. The delegation then visited and laid wreaths at the Road 9 War Martyrs Cemetery, which is the resting place of 10,000 fallen combatants. On the occasion, localities nationwide took activities to commemorate heroic martyrs and take care of policy beneficiaries. Southern Hau Giang province spent nearly 4 billion VND to organise visits and present gifts to families of people who rendered service to the nation. In Ninh Thuan province, a meeting was organised to praise 35 individuals who stood out in the national revolutionary cause. Central Ha Tinh province set aside 5 billion VND for gifts to 5,130 families of war martyrs and invalids and 23,800 gift packages to relatives of war martyrs.